Combine the beef mince, garlic, curry paste, green onions, breadcrumbs and egg . Season and shape into 4 burgers. Preheat the barbecue flat-plate or pan to moderately-high heat. Lightly brush the burgers with oil and place the burgers on the barbecue or in the pan, reducing the heat to medium. Cook for 5 to 6 minutes each side or until cooked to your liking, turning the burgers once. 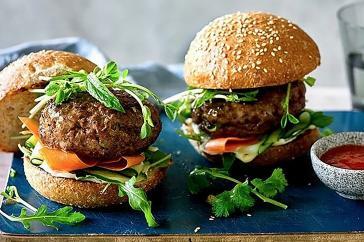 Serve burgers on toasted buns with rocket, cucumber, carrot, sprouts, mayonnaise, coriander and mint leaves and hot chilli sauce, if desired. Enjoy!